I am ashamed of myself, but I’m not sorry. I’d do it again… I’d do anything to satisfy my ramen craving. I’ve had ramen cravings strike before, but I’d always been able to fulfill them by visiting one of DC’s rapidly multiplying ramen places. I either wait two hours for a bowl at a very small but popular place, or I drive to get some. But I was short of time, out of a car, and hungry for some soup. What to do? I had to make my own, but the noodles were a huge challenge. I HAVE NOT been able to find a suitable ramen noodle, so I had to turn to the dark side. Yes, I used Top Ramen noodles (hangs head)…and they were delicious! Ramen broth is really important, so start off by making your own chicken stock, adding in a package of raw chicken wings along with the cooked carcass for extra flavor. The smell of simmering chicken stock is beyond wonderful. 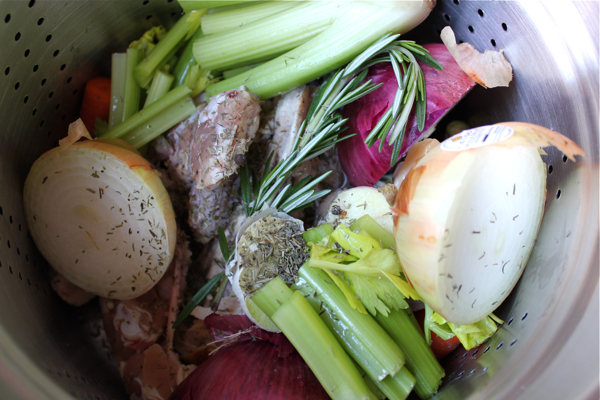 Once the chicken stock is ready, transfer the amount you need into a pot. For 4 servings, 3 quarts of stock are plenty. Slice the vegetables that you want to have in your soup, and drop them into the simmering stock to cook. I used 1 zucchini, 1 pint of shiitake mushrooms, and broccoli florets. Once the vegetables are almost cooked, drop in 2 blocks of dried ramen noodles. 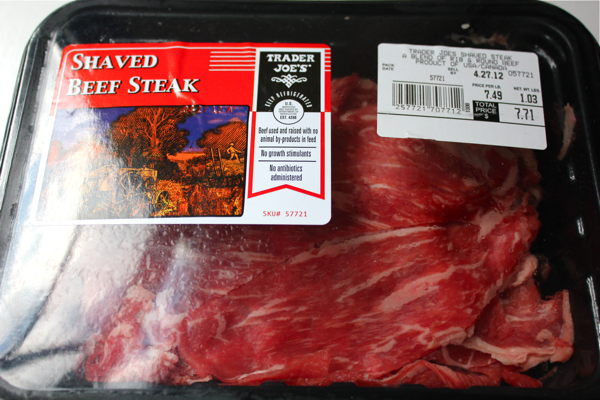 After the noodles have cooked for 2 minutes, drop in 1 pound of thinly sliced beef. The beef cooks really quickly. 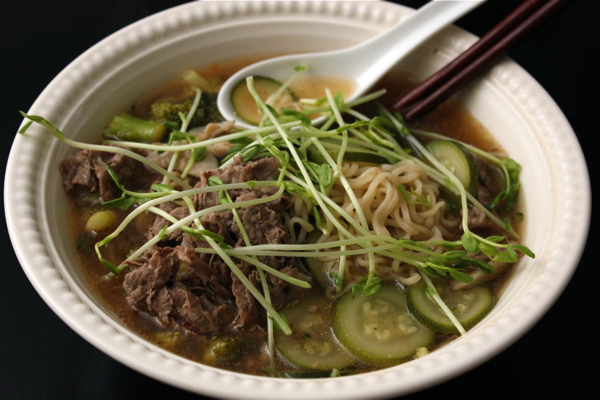 Now it’s time to make your broth really savory. Add soy sauce to taste, about 3 tablespoons of the low sodium variety. Then, to give my ramen some extra dimension, I whisked in 2 tablespoons of General Tso’s stir fry sauce (whisk the sauce with a small amount of stock to thin it out and then stir it into the main pot). Alternatively, you can enrich your broth with any combination of the following: fish sauce; miso paste; gochuchang; or anything else you think will work. At this point, your ramen is ready to serve, but there are some things you can do to pump it up. Sprinkle some pea shoots over the top for freshness, and/or drop in some corn kernels, bean sprouts, bamboo shoots, or anything else you like. You can also (and should) add in a halved, soft boiled egg. 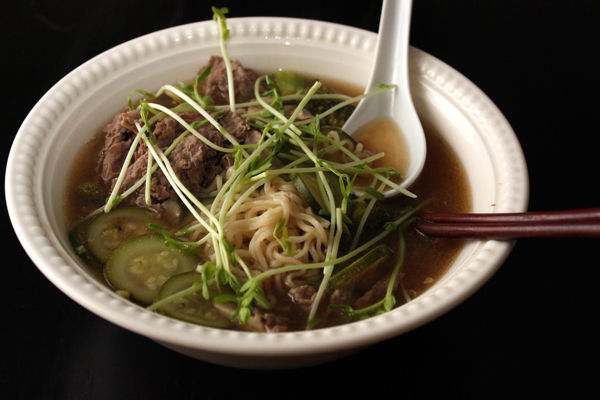 Eat your ramen out of a big bowl with chopsticks and a big spoon, and enjoy! Feel comfortable and cozy, and satisfy your cravings. Maybe you’ll even create some! How delightful to see this post. My husband & I just this weekend watched a documentary on Create TV on the RAMEN craze…the founder/inventor in the 1950’s, and etc. it was a special program…mouth watering and educational..and we thought how in our small college town could we ever try this noodle/or the soup . then your email/blog arrived in my in box. We are ready to try your beautiful recipe! Thank-you for the pix of your perfect Stella! Your fave nose…. Your recipe looks fab! Keep the pix of Stella coming please:). Posting Stella pictures is always my pleasure! !